The Parry Company is ready to be your one stop resource for water filtration media products. Municipal water treatment plants, original equipment manufacturers, and industrial water treatment facilities are among the varied industries we serve. As producers and processers of silica sand and gravel for over 50 years, our experienced staff can provide expert technical support, competitive pricing quotes and on time freight delivery. and around the globe. We are growing and look forward to serving you now and in the future. 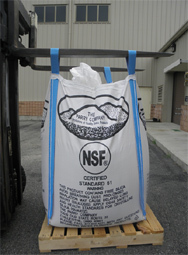 Our silica water filtration media is processed and delivered in 20, 30, 50, 100 and 3,000 lbs. bags. Please see our Packaging Sizes page for more information. Email us at info@parryco.com. No project is too small or too big for our capabilities.